We would like to share with you our top 5 watches out of the inventory for the upcoming Christie’s Auction of ‘’ Rare Watches Including Important Private Collections ‘’ to be held on 16th May 2016 in Geneva. About ten days ago, we had the opportunity to see approximately 30 pieces of watches in person, which will be listed at the upcoming auction of Christie’s to be held in Geneva on 16th May 2016, during the Istanbul Premiere of the event that took place at the beautiful Soho House of Istanbul. 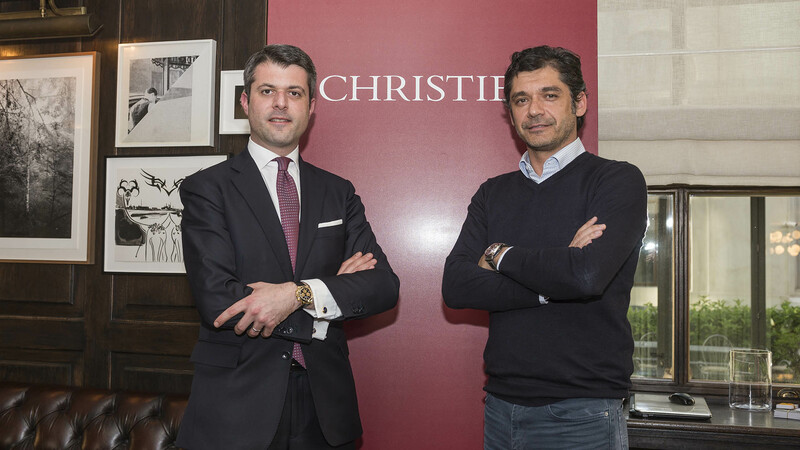 We also had a pleasant chat with Christie’s Watch Division Director and Auctioneer Thomas Perazzi as well. Recently, I have acquired the official guide for the upcoming auction which includes information regarding the 276 items expected to meet the new happy owners by the end of the Rare Watches Including Important Private Collections auction which granted us the opportunity to review many important models that we could not see during the Istanbul Premiere. We would like to share with you our top 5 models among the lot. Good news is you don’t have to go to Geneva to participate in the auction. You may join the event through internet if you like or simply contact with one of the Christie’s consultants which will be present in the auction. You can bid live or set an upper limit for the items you are interested in and wait for the auction to begin. All you have to do is to get in contact with the experienced team Christie’s. According to the Archives of IWC, the present watch was sold to Zwyro AG in Schaffhausen on 17 November 1975. 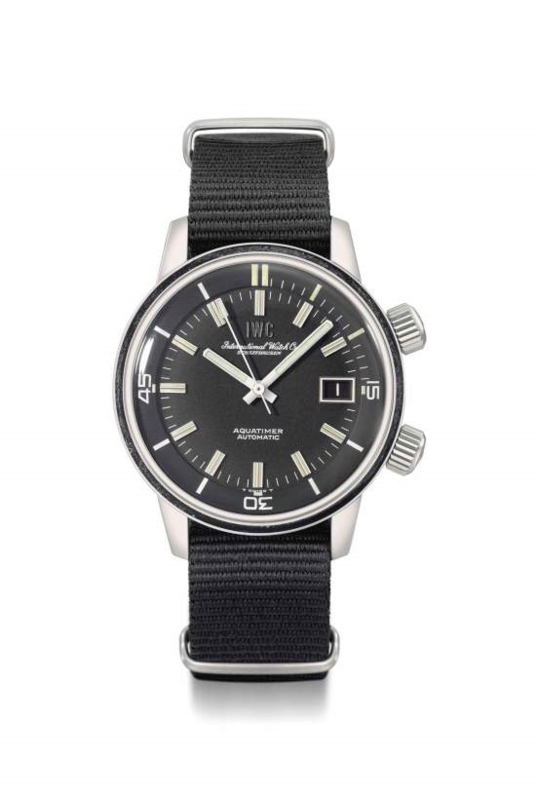 Launched in 1967, the Aquatimer is an intriguing example of early waterproof wristwatch. It was first released with the reference code 812, which was changed to 1812 in 1972. The present piece is consequently one of the last examples bearing the old reference. A notable feature of this movement is the “Pellaton” winding system, widely praised for simplicity and efficiency. Instead of using gears, it transmits energy to the mainspring via a cam, rocker and ratchet wheel system, managed by ruby rollers. Cal. R.134 automatic anti-magnetic jewelled movement, black gloss dial, luminous baton and applied Arabic numerals, luminous hands, sweep centre seconds, window for date, tonneau-shaped water-resistant-type case, bidirectional revolving black bakelite bezel calibrated for 60 units, screw back with antimagnetic protection shield, screw down crown, case, dial and movement signed by makers. Cal. 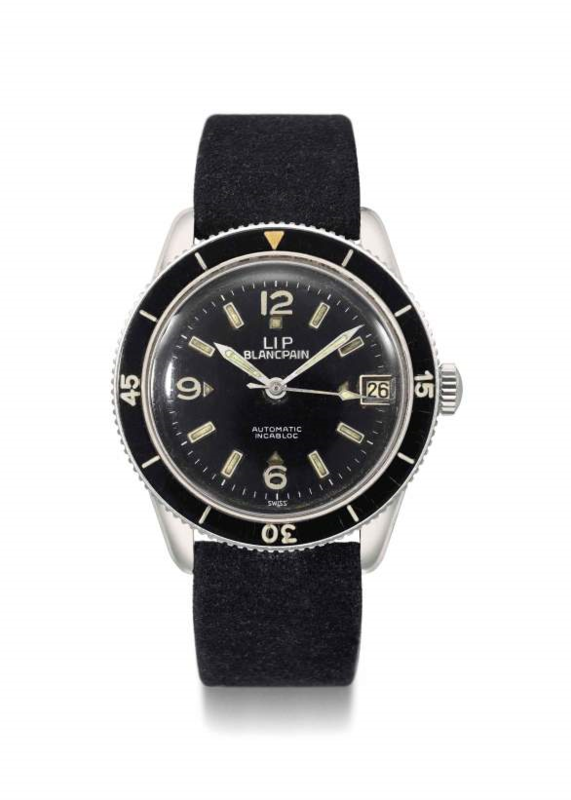 12.68ZS mechanical movement, 17 jewels, two-toned silvered dial, applied Arabic and baton numerals, sweep centre seconds, circular water-resistant-type case, snap on back, case, dial and movement signed. 35 mm. diam. 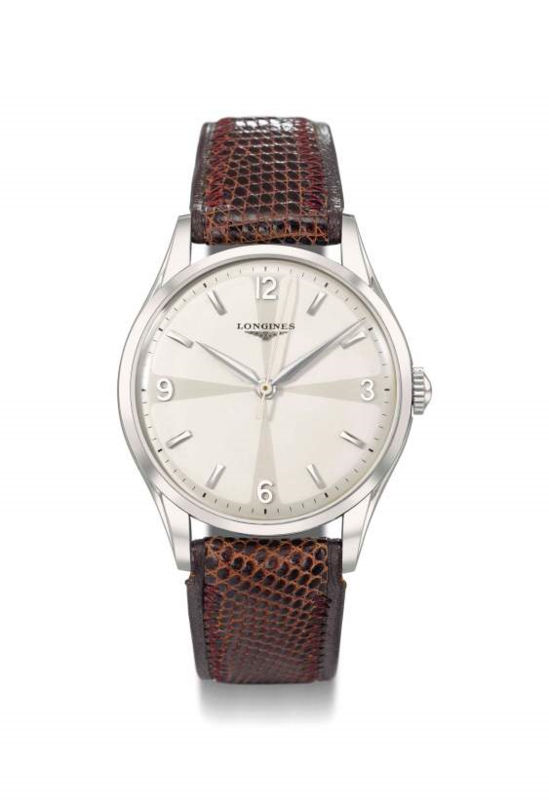 With Longines Extract from the Archives confirming that the present watch, ref. 8035, was invoiced on 6 September 1956 to company Sherly, at the time their agent in Hong Kong. Furthermore delivered with the original Longines sales tags, one bearing the movement and reference numbers of the watch. 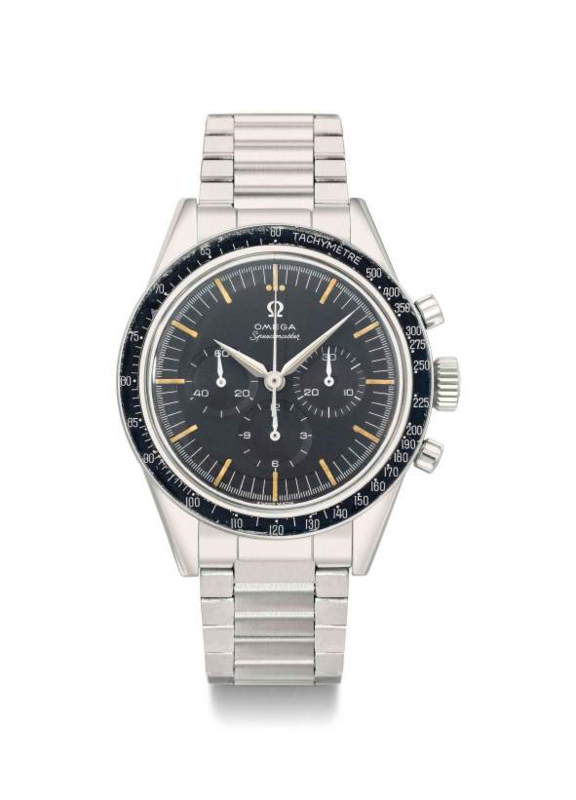 According to the Archives of Omega, the present watch was manufactured in 1963. It stands out by its very good, original overall condition, still retaining the original crown featuring the old Omega logo, original bezel, the original crystal displaying the micro size Omega symbol in the centre and the semi extendable bracelet. This watch is from the second series of the Speedmaster Professional line launched in 1959 as reference 2998 which became ST 105.002 in 1962. The model differs from the first series by the Alpha hands, the tachymeter scale now in black aluminum and calibrated to 500-60 km/h instead of the previous “Base 1000 300-60 km/h”. 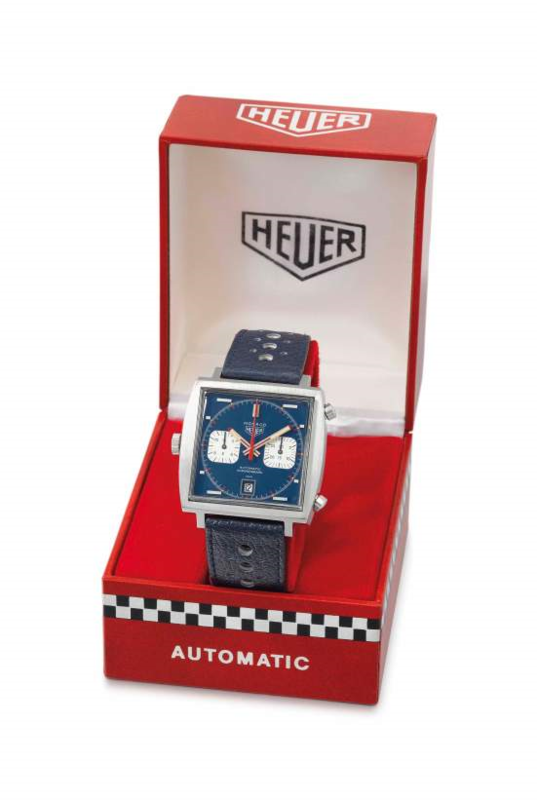 The Heuer “Monaco” was designed by Jack Heuer and named after the celebrated Formula One race track. It was introduced simultaneously in Geneva and New York in 1969. The very first series was fitted with a Calibre 11 self-winding movement and a metallic blue dial with white registers. The Monaco was the first square-cased and water resistant chronograph. Very soon after its launch, a version with the improved Calibre 12 was released, as rare as its predecessor. Also nick-named “McQueen Monaco”, it became synonymous with Steve McQueen when he wore it in his 1971 film, Le Mans.